some days just require brunch foods at unique hours. like 6:30 pm. but to be honest, brunch is okay with me at any hour of the day, any day of the week, especially when it's as good as fairground's. a few weekends ago, my cousin alicia was in town visiting, so we reserved a day to wander around museums + drink coffee + eat all the pastries. we ordered countless drinks + bites + while doing so, the staff was incredibly friendly + gracious, even with our three indecisive personalities - haha! they also didn't care that we snapped a million photos for about 10 minutes before trying our order :) i had been to fairgrounds before, with my friend sarah, + had to take claire + alicia here so they could try it for themselves. anyway, this was the time we had brunch for dinner + took a lot of photos. just thought i'd share. thanks ok bye! guuyyyyyyyys!! we did coffee, we did ice cream, + now... it's time for donuts!! my friends claire, sarah, + i ran all around chicago to find the best donuts + tell you all about them! [even if you didn't want to know - haha!] i hope you'll watch the video of our whole adventure! you can also find a written review below :) happy national donut day friends! our first stop of the day was the doughnut vault! we made sure to go here first because once the donuts sell out, they're gone for the day! they have two locations, so that helps maximize your chances of getting donuts - we went to their franklin street one. it's a nice little walk in space with seating outside only, so in the wintertime things get a little challenging. the doughnut vault also switches up their donut flavors daily, + keeps you updated on twitter! the sales guys there was super nice + offered us extra donuts when we told him what we were up to for the day. overall, we rated the doughnut vault a solid 4/5! our second stop was do-rite donuts. it was a little harder to find - we used apple maps for navigation + due to it being located in the heart of the city, siri had a little trouble getting us to the exact location with all the buildings blocking the signal. the parking situation is also a bit difficult, so be prepared to walk a block or two. as far as the donuts go, they were really great -- they have a lot of good gluten free options too! overall, we rated do-rite donuts a 3.5/5. the third place we tried was the dapper donut! they were previously called beavers donuts, + it still shows up that way on navigation. these donuts are mini + super good! i've had mini donuts before, but these guys were different! a little bit crunchy. there are a ton of different flavors to choose from, + you can either get 4, 6, or 12 mini donuts in a package. it's also inside a cute little french market that i've never seen before! the ordering process is a little difficult, but we all really liked the dapper donut. overall, we rated the dapper donut a 4/5. for our fourth stop, we went to bombo bar -- you may have seen bombo mentioned in our chicago ice cream crawl! i have said it before + will say it again - bombo bar is definitely one of the most instagramable places in chicago! as for their donuts, they're more like decorated fried doughs, but worth it if you're looking for those like-worthy social media posts! overall, we rated bombo bar a 3/5. our fifth + final stop was stan's donuts! i have always loved stan's, + i snag a donut from them almost every time i'm in the city. we went to their wicker park location, but they have a decent amount of other locations all around the city! one thing that really makes stan's stick out is the offering of [really good] gluten free + vegan donuts - they really accommodate for different dietary restrictions. they also sell bagels, coffee, tea, gelato milkshakes, + more. overall, we rated stan's donuts a 4.8/5. THIS + THAT'S CHICAGO ICE CREAM CRAWL! guys!!! i'm so excited to announce THIS + THAT'S CHICAGO ICE CREAM CRAWL! i had seriously so much fun creating T+T's chicago coffee crawl last year, + i knew i had to do another! so, i reached out to all of you through instagram stories + asked you to vote for either ice cream or donuts --- as you probably guessed, ice cream won out, but don't worry donut lovers... there's still time for us :) please watch the little film - i hope you enjoy it! keep reading for more photos of each location, as well as our opinions on each spot. also, don't forget to SUBSCRIBE to youtube! as mentioned in the video, jeni's isn't specific to chicago, but it is absolutely still worth adding to the crawl! the unique flavors are what makes jeni's so awesome. by their names, the flavors might sound a little funky, but no matter how crazy the title, they always taste amazing! maaaaaybe the most instagramable food items available for purchase in the city of chicago --- + seriously, they taste as good as they look! bombo bar has great walk-up window + is actually a side biz of bar sienna, which resides right next door. they also serve meal-type food, + their treats are available all year round! they have a version of the chocolate milkshake that they serve as hot chocolate in the inter, + it is seriously a must have while you're in the windy city!! cone is great for the traditional ice cream route, but they also give their own spin to sundaes + cones! i'm not sure why we didn't see them when we were there [you know we would have gotten a lucky charm covered cone!!] but the ice cream we had was still amazing! it's also in the best location, + almost everyone who works there is irish - fun little fact! they also sell irish candy + other products specific to the green country! are you craving a scoop yet? ;) i hope you've added at least one of these places to your travel bucket list + enjoyed the video as much as i did while making it! 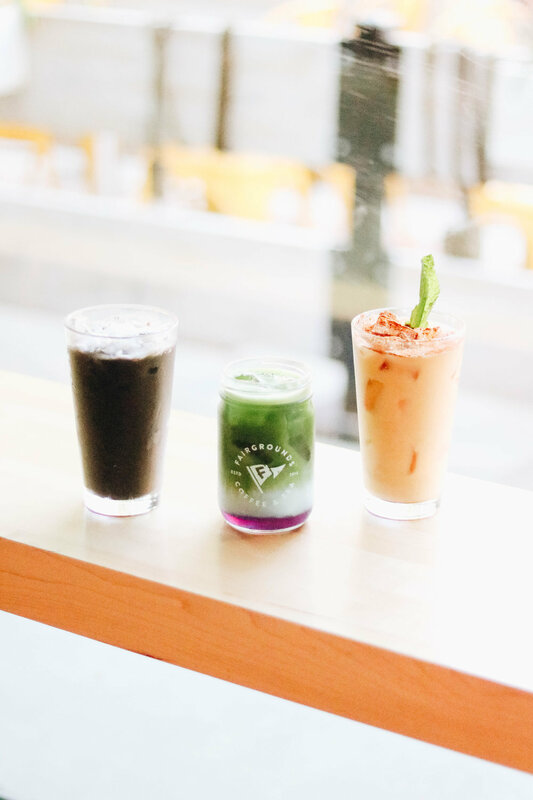 stay tuned for even more chicago crawls + guides, but in the meantime, see all my chicago favorirtes here, T+T's chicago coffee crawl here, + subscribe to youtube for future videos here! i can officially die happy, or at least really really content. i'd been following @thefestivecollective + their sister stores @bashpartygoods, @luft.balloon, + @anneandkate on instagram for a while, due to their location in chicago + their general awesomeness, but had never actually been to the brick + mortar store. when i saw a post about the "funky disco donut bash" they were hosting, i cleared my schedule, texted a friend, + awaited the weekend. along with donuts + party goods, their were multiple vintage vendors + THE cutest custom embroidery station care of @daily_disco! we spent the morning browsing, making multiple purchases [yeah, that one was me], + trying not to die of a wonderment overload. be sure to check out the festive collective's instagram + site --- this isn't sponsored i've just got a biz crush + i want to share! here's to pretty donuts + banana dolphins + cool stationery + balloon displays + embroidered denim + happy things. if you've been reading the blog for sometime now, you know that i'm always down for a city adventure. last weekend, my cousin alicia was in town, so claire + i decided to head to one of our favorite spots, left coast food + juice, for a little friday night acai bowl fix. we got dressed up, plunged ourselves into the chicago traffic [#bullsgame], + enjoyed a night out. can we just talk about this gorgeous necklace for a sec!? it's the rahisi horn necklace from jimani collections, + i'm in looooove! jimani "exists to transform and expand access to economic opportunity for artisans in underserved communities worldwide" + i've loved getting to know their company! they work with some of the poorest women in the world who have experienced a reality that is unfathomable to most of the earth's population. through training programs, they offer work + schooling that educates them + makes beautiful pieces of jewelry in the process. "by building a bridge between consumers and artisans, we are able to promote equitable trade while alleviating widespread poverty". companies like this are seriously the best, especially when their products are as cute as these! left coast seriously has the yummiest food, + it's all vegan! we enjoyed our smoothies + grain bowls, chatted about a ton of stuff, + just hung out like girls do, ya know!?! ;) cheers to pretty necklaces + city adventures + yummy food + friends!